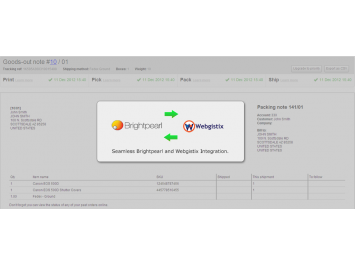 Our Integration Portal for Brightpearl offers integration with Webgistix that runs seamlessly in the background, updating Brightpearl orders with feedback provided by the Webgistix API. Keeping our customers data safe is key, which is why our Webgistix Brightpearl integration is PCI Compliant. Reducing costs and protecting your business. Don't waste time entering orders into Webgistix manually, allow our integration to do the repetitive data entry tasks for you and eliminate any human error. There is a monthly charge for the service of that starts as low as £14 ($21.50) and a one time subscription activation fee of £65 ($99).